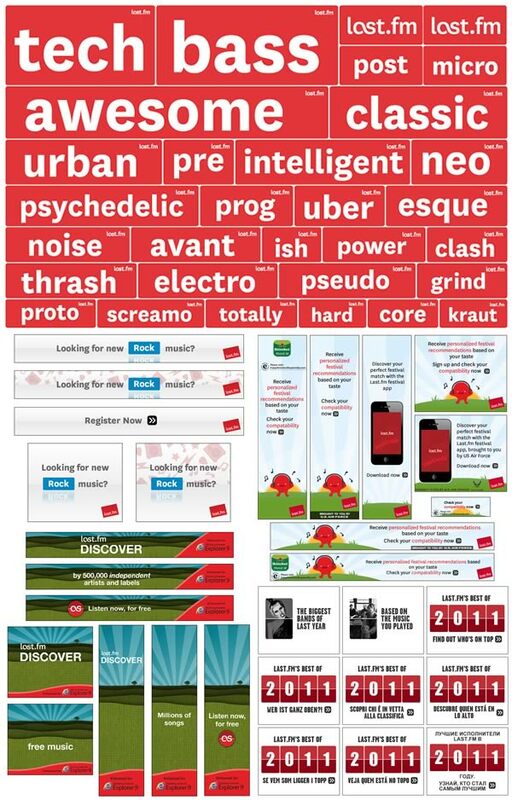 Print ads, online ads, other misc. Stickers? Sure, why not. I’m getting a bit sick of saying ‘oh, there were a lot of these’, but oh, there were a lot of these. It just doesn’t make sense to include everything, as we’ll be here all day. I’m trying to split them out into different projects and I suppose this would come under ‘in-house’ or something like that. So stuff for Last.fm themselves rather than any third parties or what have you. Them stickers were the best ones, just based on what you could realistically get away with as a music genre. You could join them and get ‘Techbasssupergrind’ and I would put money on that tag already existing somewhere on their site.